McDonald's is celebrating its best sales performance in Europe for 15 years after consumers got a taste for new products like chicken snack wraps. Sales rose 5.8% at the restaurant chain's European outlets in 2006, boosted by the UK launch of a new bacon burger and a prize game in Germany. McDonald's performed strongly in other markets, reflecting its steady recovery from a sharp sales downturn in 2002. It has added healthier options to its menu to try to attract new customers. This followed adverse publicity linked to growing obesity rates in the US and Europe. Over the past few years, its stores have been offering a wider range of salads and fruit as well as premium strength coffee. In a trading update, McDonald's revealed that global sales, on a like-for-like basis, had risen 6.3% in the fourth quarter and were up 5.7% for 2006 as a whole. 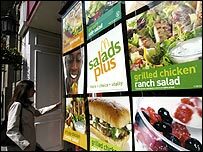 McDonald's said its upturn was driven by its emphasis on making its meals relevant and affordable to consumers. "McDonald's performance for the year reflects our ongoing commitment to continuous improvement," said chief executive Jim Skinner. The US firm will publish profit and sales figures later this month.